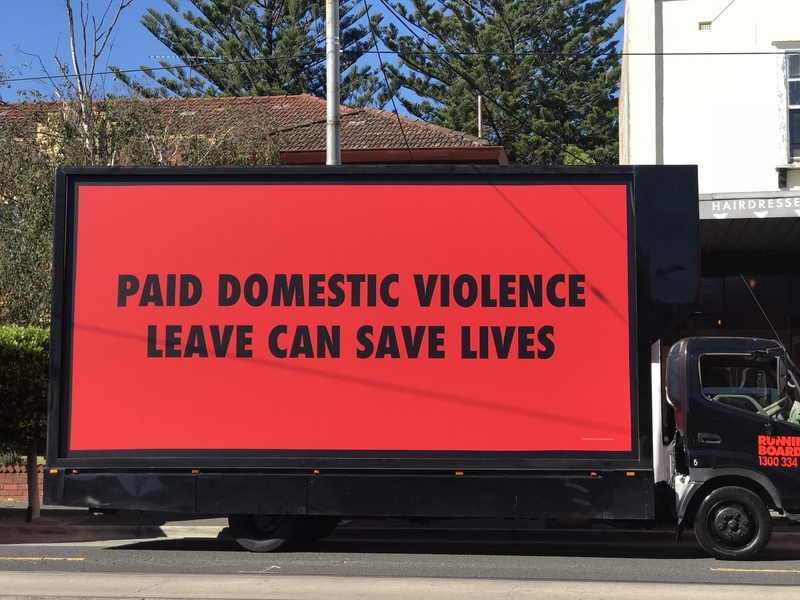 Union protesters in Australia have placed billboards calling for paid domestic violence leave outside a politician's office on International Women's Day, in homage to the Oscar-winning film Three Billboards Outside Ebbing, Missouri. 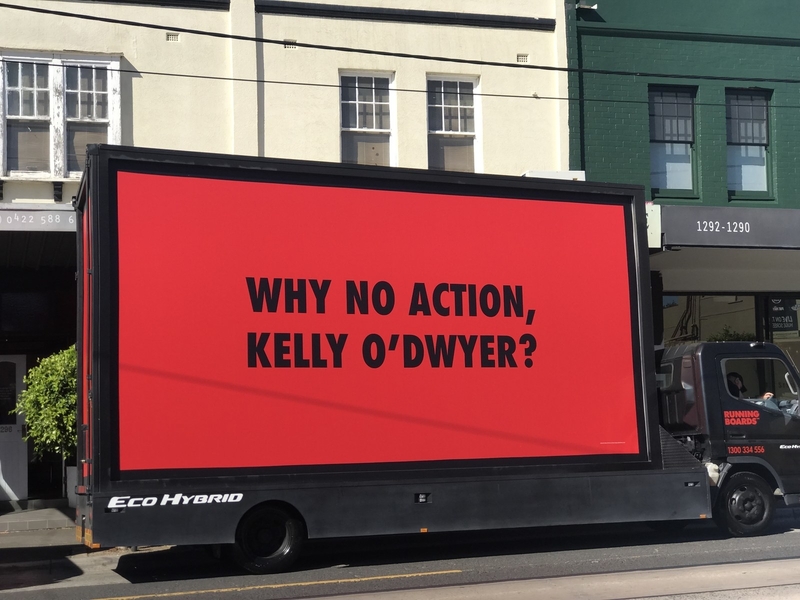 The distinctive red and black mobile billboards carried three messages: "Women Are Being Killed", "Paid Domestic Violence Leave Can Save Lives" and "Why No Action, Kelly O'Dwyer?" 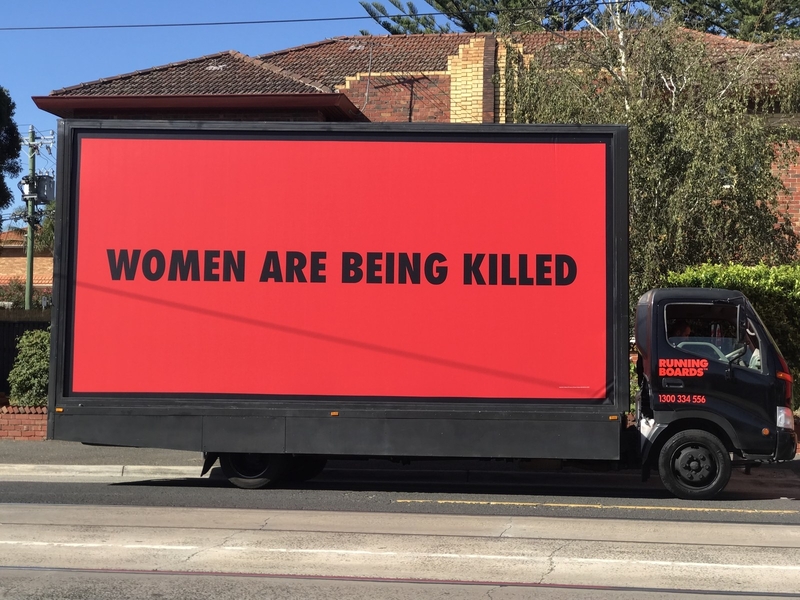 The three billboards circled the streets of Melbourne on Thursday morning, before parking outside the electoral office of the minister for women, Kelly O'Dwyer, in Malvern. Australian Council of Trade Unions (ACTU) secretary Sally McManus (below) is behind the "We Won't Wait" billboards campaign, urging prime minister Malcolm Turnbull and O'Dwyer to make it compulsory for workplaces to offer 10 days of paid family violence leave. Under current Australian law, domestic or family leave is not mandated by the government or enshrined in the minimum award. Some workplaces have chosen to make it available and other workers have successfully bargained for unpaid domestic violence leave. In July last year, independent umpire the Fair Work Commission (FWC) rejected the ACTU's bid for 10 days' paid domestic violence leave. Bill Shorten has promised to legislate for the full 10 days of leave in the National Employment Standards if Labor wins the next federal election. The Liberal National coalition does not currently support creating the leave. McManus said the prime minister talked a big game on violence against women but "he doesn't back his talk up". Turnbull was criticised last week for defending an outburst from employment minister Michaelia Cash, who threatened to name every woman in Labor leader Bill Shorten's office who had been the subject of rumours. Tired of being ignored, McManus decided to recreate the billboards from the Oscar-winning film and take their message to the streets. “Like Frances McDormand’s character in the film, Australian women are outraged," McManus told BuzzFeed News. “We have lobbied [the government], gone through the courts and regulatory bodies, and come up empty-handed," she said. "Women experiencing violence need paid leave to be able to leave." McManus believes that in 2018 women shouldn't be forced to choose between their income and their safety. "We need paid domestic violence leave. We need to be safe at work and at home around the world. We are not being quiet and we are not going away." O'Dwyer slammed the billboards as a "cheap political stunt" that she estimated the union is spending over $8,000 a day on. "I think that it is absolutely disgraceful that Sally McManus and the ACTU would play politics with domestic violence in an attempt to score cheap political points," O'Dwyer told BuzzFeed News. O'Dwyer said the FWC is currently considering the inclusion of domestic violence leave in all modern awards, and that the government will review its position after the FWC's decision. "We encourage all employers to support their staff during such difficult times." One in three women in Australia has experienced physical or sexual violence by someone known to them, according to statistics from White Ribbon. On average one woman is killed every week by a current or former partner. Domestic and family violence is the number one cause for homelessness for women and their children. Two in five assaults reported to the police in 2016 were related to family or domestic violence, and one in five women have reported experiencing harassment in the workplace.